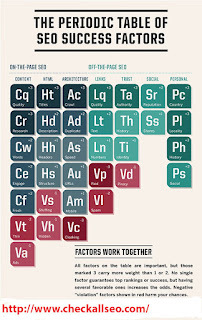 There is good news for SEO webmasters because Danny Sullivan has published Periodic table for SEO success factors 2015. In this table you can judge easily what all things will be work great for you in your SEO strategies? This table is showing how you should go ahead with the balance of both On-Page SEO and Off-Page SEO activities. Beside that html and social media optimization have their own identity as well and it had proved in recent ranking factors. The motivation behind the update of this table is you should try to describe more and more about that niche of your website. Now Google wants to see quality on any how because there is no mercy for spammers. Periodic table was also updated in 2013 and now there is some another parameters added in the edition of 2015. These all things are looking small but they have big values in today’s SEO strategy. 1. Content: I don’t think so now there is any doubt on that what is the first priority to impress the Google without any question it’s content. But for that you should need to open your mind and when you will write all things about the visitors and readers of your site then you can see the difference. The successful way to impress the readers and Google both is that you have to write deeper about the niche of your customers and readers. 2. Architecture: Now you will need to improve the overall quality of your website, So in that you should notice Crawling status, Duplicate templates, Mobile Friendly, Speed of the website, Url structure and Https status. When your website will pass all of these parameters then your site’s overall functionality will count positive in the eyes of Google. 3. HTML: Now you will have need to improve each and every thing in coding section because if there will be any error in html coding of your webpages then it could be give negative results. HTML coding errors can harm your site’s crawling status. 4. Trust: Google loves those all sites which have good trust from visitors points of view.It is so simple you can do it from your end when you will provide enough and deeply information on your website which readers and visitors wants from your end then it will increase the authority of your website. Beside that domain age could also play a major role in that because on some points Google also see the domain age in the factor of trust and authority of a website. 5. Links: There is no doubt without back links your website ranking could not improve. But on other hand you could not forgot the one of the major algorithm of Google which is famous by the name of Google Penguin. Now there is no need to make back-links in quantity instead of it you should try to get quality back links from high authority websites which is possible with content marketing. 6. Social: It has been clear when you will do social media optimization with the good ways on major social media sites then you can see how your website’s keywords ranking will boost in less time. But for that you should have good social networks as well related to your website niche.